We have just been away camping and birding and had an amazing time. The birdlife in the Kimberley is always a pleasure to observe, but when you get the opportunity to return together to a place that you first visited 25 years ago almost to the day it does make it even more special. 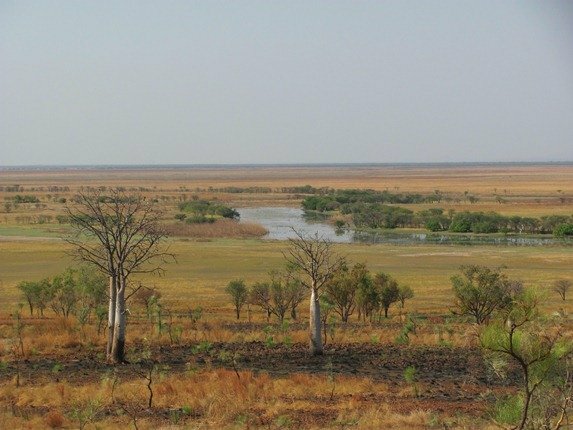 We travelled from Broome north on the highway to reach Parry’s Lagoon Nature Reserve, which is about 1000 kilometres from home. This may seem like an incredible distance to some of you, but in Australia that is a 12 hour drive with only two small towns and a small community to pass through. You need to be aware that you will only see a fuel stop every few hundred kilometres and there will also be little or no phone network. You will see little traffic and the trucks can be 53.5 metres (175.5 foot) long, which you need to think about seriously before you attempt to overtake them! You will also discover that just because there is a river marked on your map it does not mean there will be any water in it at this time of year, but if there are any pools of water it is worth stopping to see what birdlife is about. 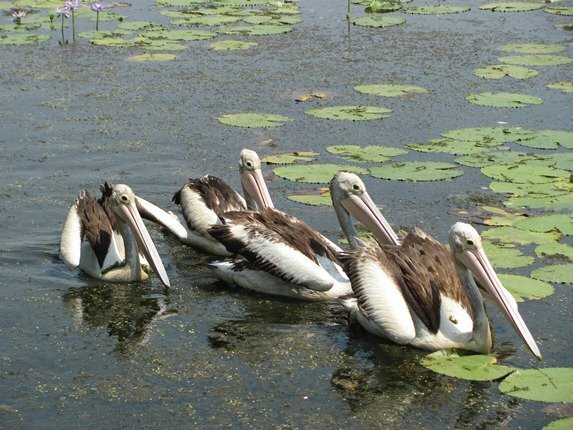 The turnoff to Parry’s Lagoon Nature Reserve is just before you get to the small port town of Wyndham, which is significantly cheaper for fuel than nearby Kununurra. The road is gravel and information is provided year round as to its accessibility. 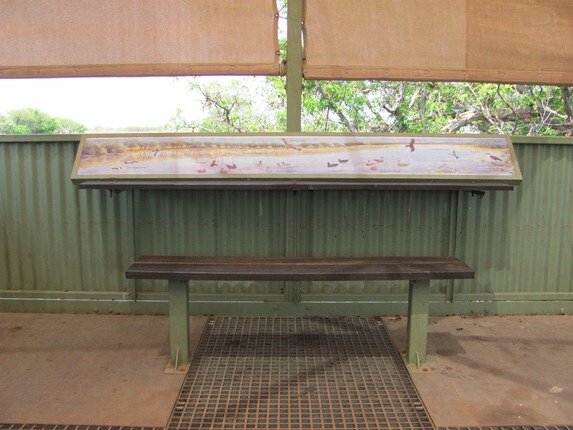 It is only a short drive in over a small hill to the bird hide at the billabong. The information on the government website is very limited, but you should not let that put you off. We had several other people visit the hide during the hours that we spent observing birds, but most only stayed a few minutes as they were on a schedule to see as much of Australia as possible in a limited timeframe. If you enjoy observing birdlife you do need to consider an hour or more at this location to be truly rewarded. 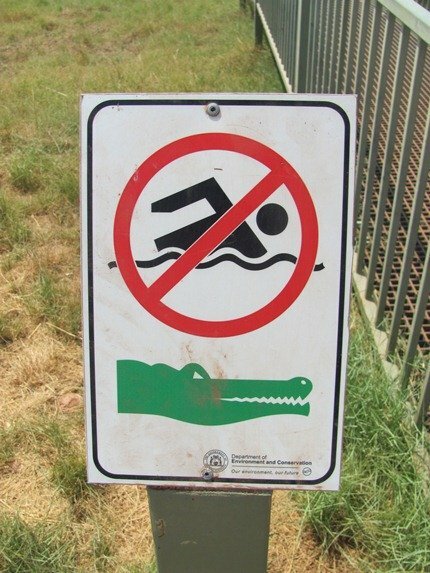 As you walk onto the boardwalk to walk out to the hide you will notice a sign about crocodiles. You may think that it is unlikely because the water looks so shallow at the end of the Dry Season, but don’t be tricked. A Crocodile does not need much water to survive in. As you walk out towards the hide the birdlife is not the least bit bothered about any human activity and remains along the water’s edge. The bird hide is shaded well and a nice breeze blows through it to save you from the dry 40c (105f) September days. There are informative paintings of the birdlife that you may experience and benches positioned well for observing the area. You may notice a line in this photo around the wall, which is the water level from the last Wet Season!! It is designed to go under water during the floods and need minimum maintenance once the water subsides. 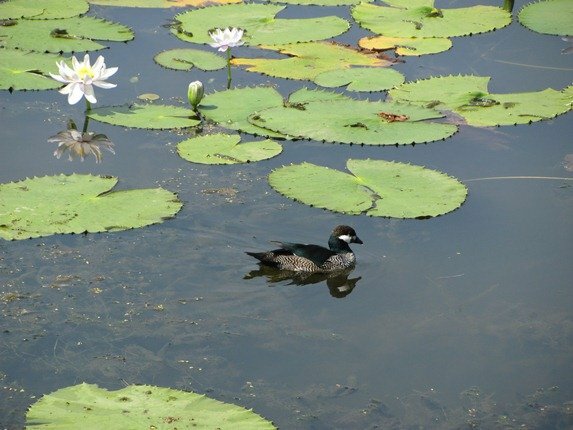 There are large numbers of ducks including the Radjah Shelduck, Plumed Whistling Duck and Hardhead. 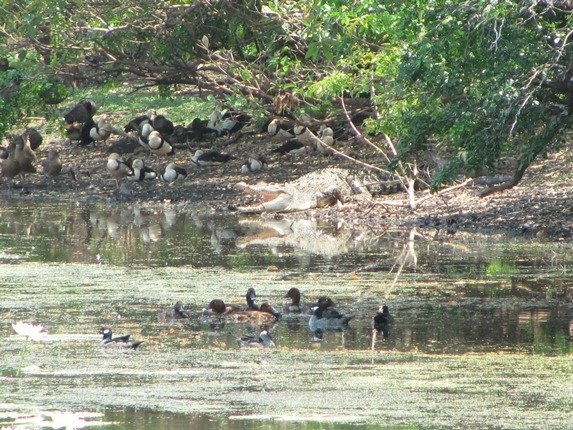 The evidence above shows that there really are crocodiles in the billabong and the ducks are currently at ease with it! 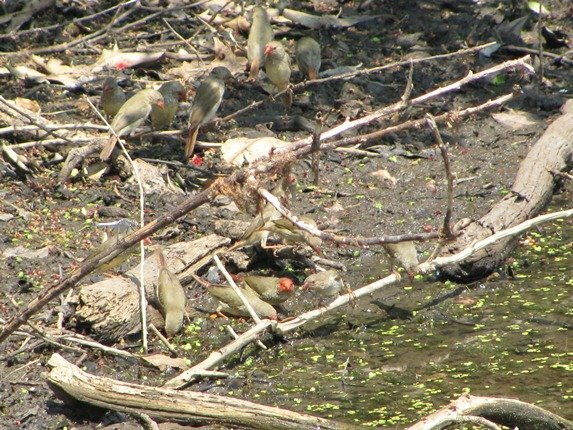 The birdlife can be quite well camouflaged and we had a flock of Star Finch come in for a drink and they blended in so well with the natural environment. If it wasn’t for the red heads and bills they would almost merge into the landscape. 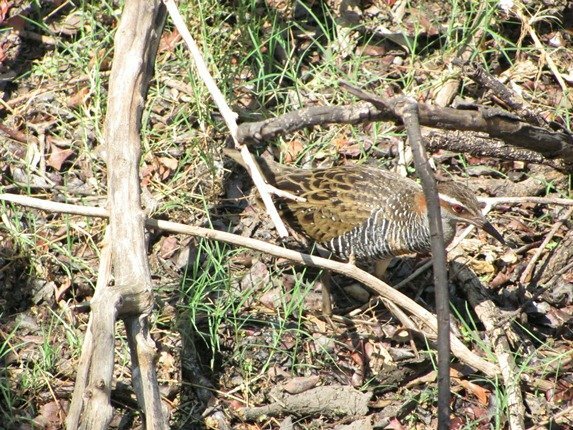 We heard some rustling near the boardwalk close to the hide in the middle of the day and closer investigation produced an active Buff-banded Rail. There were only four Australian Pelicans in the area that we could see and they spent most of the hours that we were in the hide busy trying to find food. A Little Black Cormorant seemed to be a lot more successful than the Australian Pelicans at finding small fish. Apart from the large Magpie Geese there were numerous Green Pygmy-geese and they happily paddled by the bird hide. 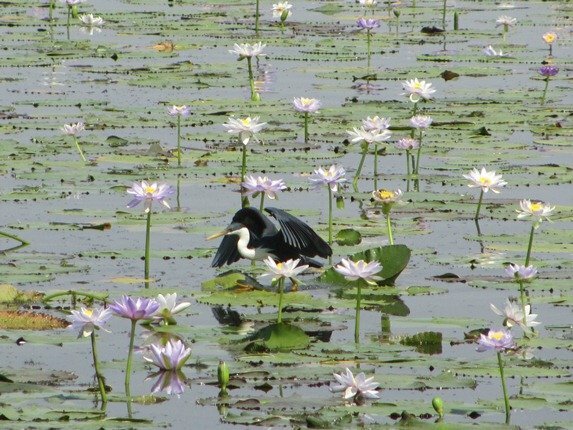 The billabong is renowned for its population of Comb-crested Jacana and we saw several juveniles balancing across the lily pads close to the bird hide. The Pied Herons were also retrieving small fish from the billabong and they really are one of the smarter looking herons! If like us you want to spend more than a few minutes in the area you can stay at the nearby Parry Creek Farm. They have a variety of accommodation available for those who are not as keen to camp as we are! 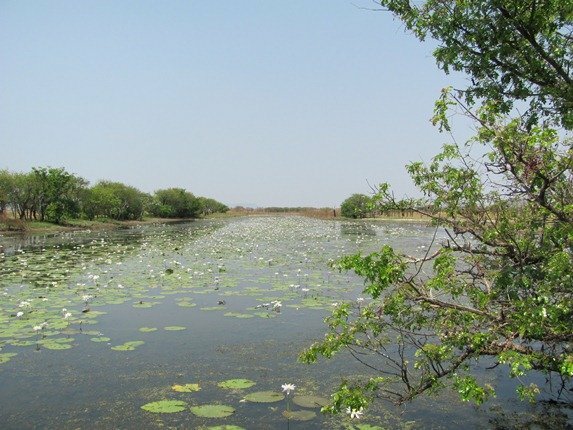 If you are camping you will be offered an area furthest from the water bodies that remain, because they really don’t want you to have a close encounter with a crocodile. There are walk trails around the property for further birding opportunities and they were also rewarding. The main disappointment on this trip was the arrival of the Cane Toad to northern Western Australia. 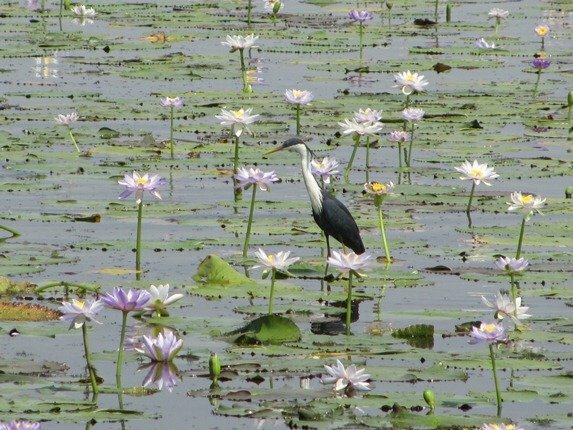 Apparently the first one was seen at Parry’s Lagoon Nature Reserve only a year ago and now they are everywhere. What a shame that they could not have been stopped before they spread across Australia doing so much damage to native animals. To think that the release of 102 toads in August 1935 could have gone so wrong is scary. We thoroughly recommend this area for anyone remotely interested in nature and the environment, but be aware of the distances and the heat as you travel around the north of Australia. Very sweet birds & a great tale. 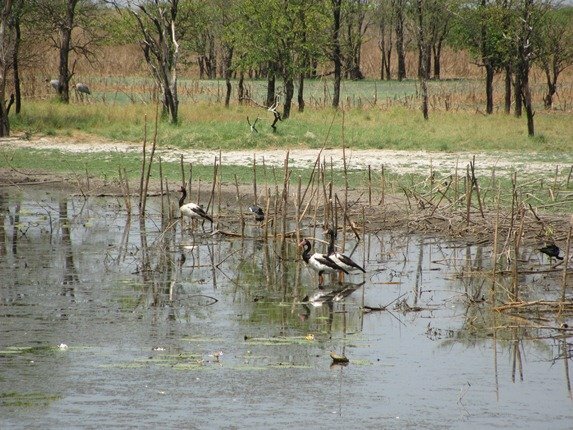 This lagoon must be huge in the wet season, judging by the area’s geography (first pic) and the line along the wall of the hide. Oh how I loved the excitement of entering hides / shags in Africa so carefully to avoid running into a Black Mamba or something. Good times. Shame about the Cane Toad!!! 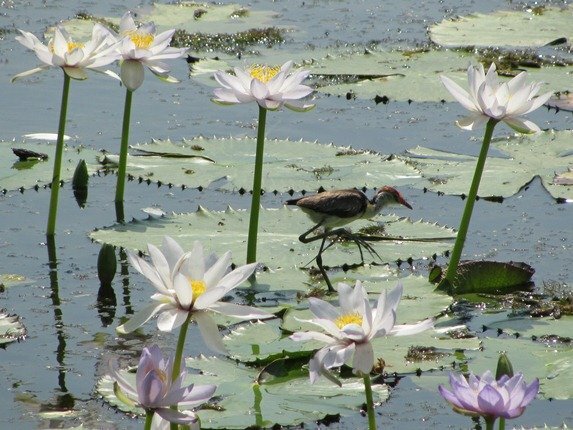 Amazing photos, especially of those Jacanas! 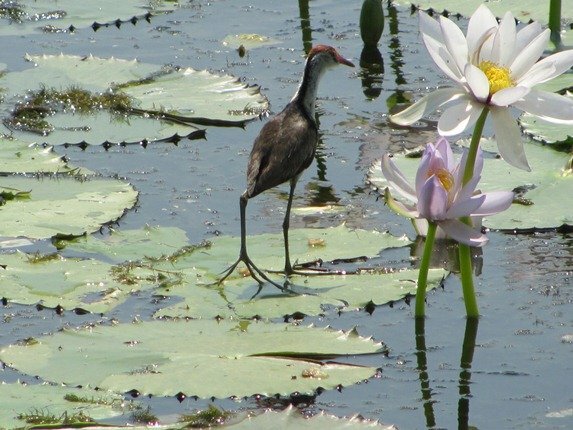 And the Pied Herons look so beautiful surrounded by lilies, too. Sounds like a fabulous trip! Thanks for writing it up for us all, Clare. @ Wendy-thanks! It was a great trip! Timing was good with the weather changing, too!